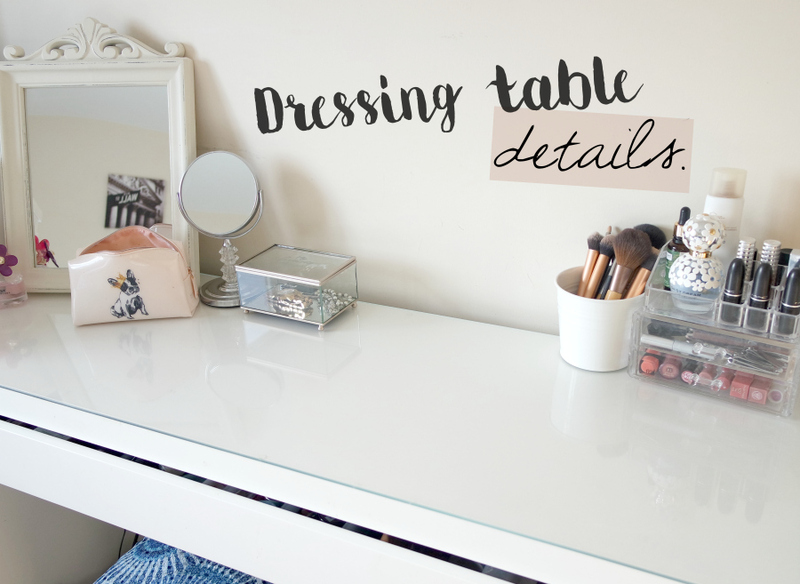 Being the stereotypical blogger I am, I opted for the Ikea 'Malm' dresser as it's a big white table with a shiny, glass top and a huge drawer for storage and at £95, it's quite a bargain for what it is, really. In hindsight, I kind of wish I'd looked around a bit longer for something a tad more unique but it's served me well and it's a very versatile dresser that can easily be styled however you want it. I'm always changing around how my dresser looks. I love buying new bits and bobs for storing my jewellery and make up brushes in but, for the time being, I think I'm settled with how it looks, at the moment. The Ikea Malm is a very long dressing table so it's easy to fill it with a lot of crap. I was getting fed up with how cluttered it looked so I decided to go for a more streamlined look (which is much easier for cleaning too.) This was actually harder than it looks as it was tricky choosing a mixture of things that I use the most often and things that, y'know, look good, to have on show. I picked up the big, cream mirror from Homesense, last weekend. I'd been on the hunt for a shabby chic-looking large mirror for ages so was well pleased when I stumbled across this - it only cost £7.99, too! The smaller mirror is also a Homesense find and is what I use when doing my make up as it has a magnifying side, which is useful for when you're attempting to make your eyeliner look on fleek. I think this was about £7.99, as well. I've said it before, on here, but Homesense is amazing for any kind of homeware - I'm always having a browse in there to see what new stuff they've got in and it's very rare I leave without buying something! 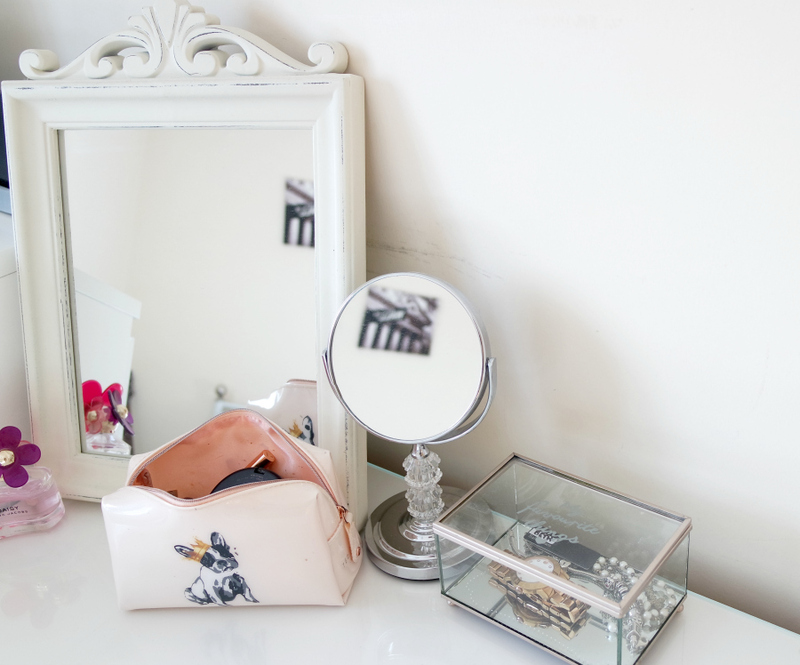 My make up bag is probably my favourite thing on my dressing table. It's from Ted Baker and I bought it last year in the Christmas sales. 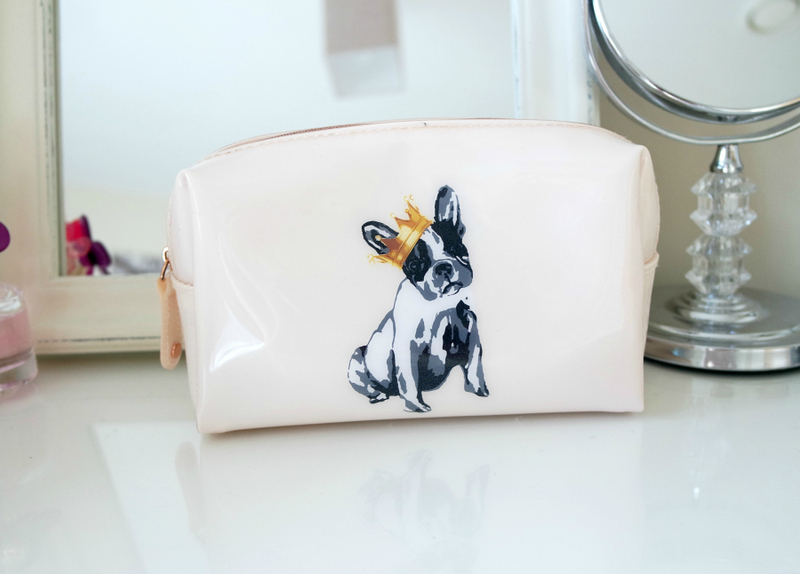 I think it was about £15 which is still pricey for a make up bag, in my opinion, but it's just adorable. It's the perfect size for holding all my daily essentials and it's got a wipeable (is that a word?) surface for those pesky foundation stains I'm forever getting on it. I can see it lasting me for at least another year, too, so it was definitely worth the investment! 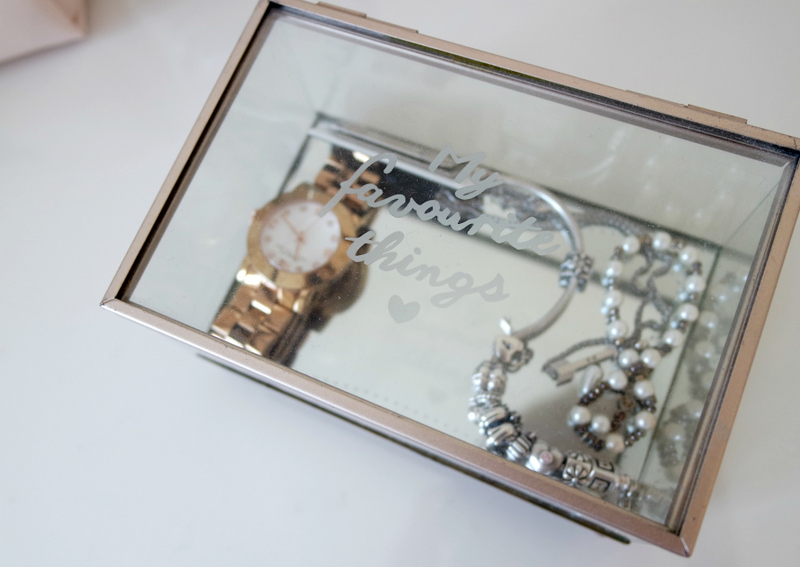 I use this gorgeous, glass and copper 'My favourite things' box for storing my jewellery away. My best friend got me this for Christmas so I'm not sure where it's from but it looks beautiful on my dressing table and I like the fact it shows off your most treasured pieces, as it's transparent. 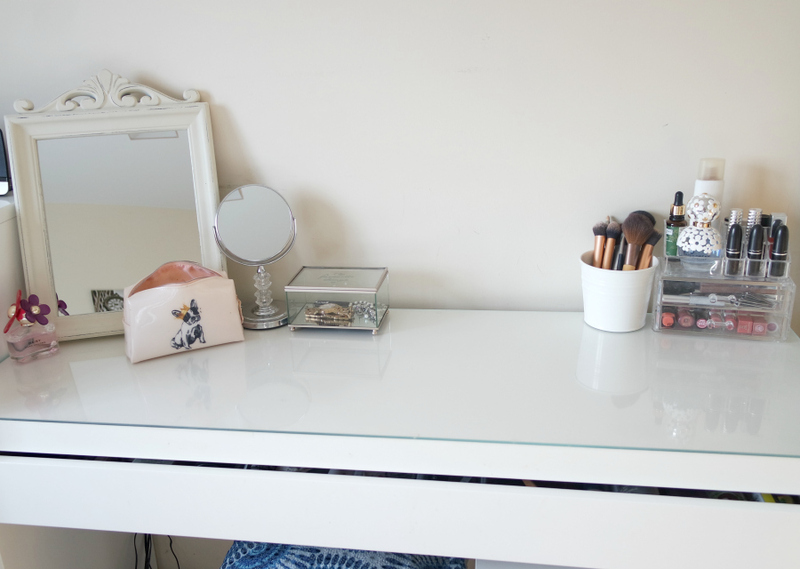 I keep the majority of my make up collection in the drawer of this dressing table and the rest of it is scattered around in various storage boxes, around the flat (#bloggerprobs). But I wanted to have some pieces of make up on show so I picked up some acrylic drawers from Homesense (shock) and the acrylic topper (which my lipsticks are in) is actually from Ebay. 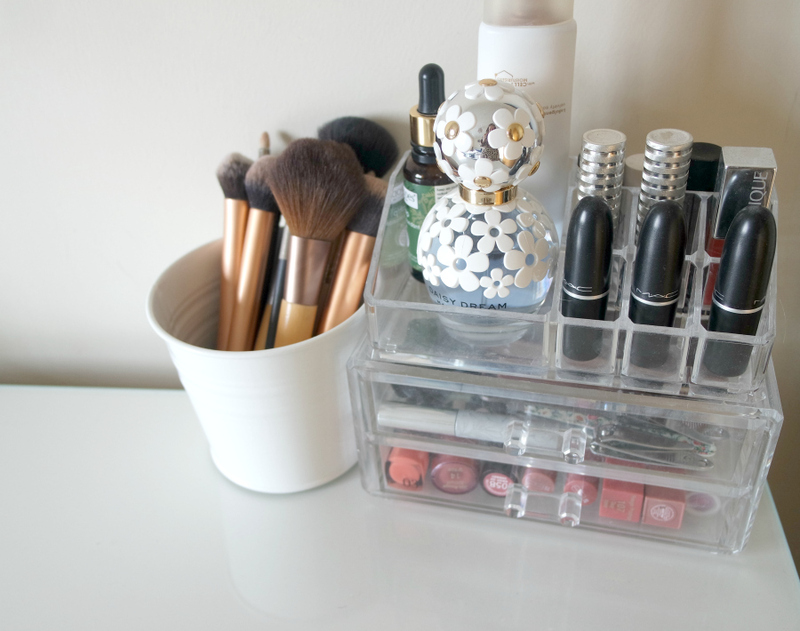 I use the drawers to store some lipsticks, palettes and boring, essential things like nail clippers and tweezers. Then, the right hand size of the topper is perfect for holding lipsticks and the left side can be used for anything, really. I usually chop and change what's kept in this little section but, at the moment, it's home to my favourite perfume, a hand cream and a serum. I got the drawers quite a while ago from Homesense so I'm not 100% sure if they still stock them but they were a lot cheaper than Muji ones so I was very happy when I spotted them! Ebay is great for acrylic storage, too. I just typed in 'lipstick holder' and had loads of options to choose from when it came to finding something that could go on top of the drawers. I think I paid about £2.99 (inc delivery!) for my holder. My make up brushes, at the moment, are just been kept in this white, tin plant pot from Ikea. It's probably a bit too big for my brush collection as I don't really have that many but maybe it will spur me on to splash out on some new brushes? I'll probably keep my eye out for something else but, for 95p, this is a good temporary solution. I really love how a lot of bloggers store brushes in their empty Diptyque candle holders but I nearly had a heart attack when I saw just how much those candles cost. Gulp. Maybe I'll stick to the 95p plant pot, after all!